I'm Swedish and German. However, my taste buds would beg to differ. I like such a variety of foods that you might say I'm closer to Japanese, Mexican, or Indian! Ok ok, not really. But, when it comes down to it, I crave flavor and if a meal doesn't have it, then my taste buds are most definitely bummed out. Mexican food has a lot of flavor and a lot of spice. This enchilada sauce has that spice and it made my enchilada so full of flavor that I wanted a second helping despite being extremely stuffed! 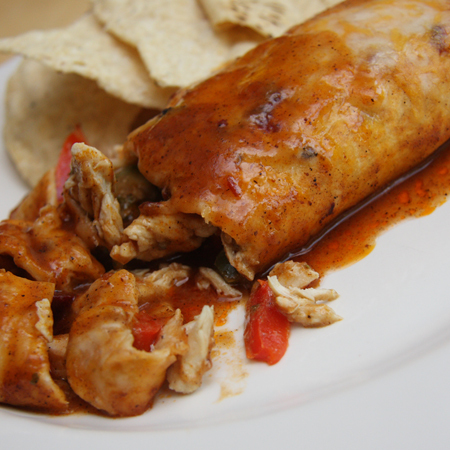 Make your own enchilada, put something exciting inside and then SAUCE. IT. UP. Happy Cinco de Mayo!